Jens takes seriously his responsibility as a respected role model for young players and never stops teaching, while at the same time amazing audiences with his brilliant, musical performances,” said John Wittmann, Yamaha. 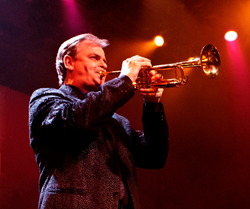 His Excellency the Right Honourable David Johnston, Governor General of Canada, has announced that he has appointed trumpet master Jens Lindemann as a Member of the Order of Canada for his skill as a world-renowned soloist and for his support of Canadian musicians and music students. Membership in the Order of Canada, the country’s highest civilian honor, recognizes outstanding achievement, dedication to the community and service to the nation. Lindemann rose to international fame in 1992 when he won both the Prague and Ellsworth Smith (Florida) International Trumpet competitions, both by unanimous juries. Since then, he has been hailed as one of the most celebrated soloists in his instrument’s history and was the first Canadian trumpet soloist to ever appear at Carnegie Hall with symphony orchestra. Recently named “International Brass Personality of the Year” (Brass Herald), he has also played in every major concert venue in the world: from the Philharmonics of New York, Los Angeles, London, Berlin, Moscow and Tokyo and even the Great Wall of China. His career has ranged from being featured at the 2010 Olympics before an audience of 2 billion people, the NHL Stanley Cup finals, playing national anthems at both the Rose Bowl and for the San Francisco Giants, performing at London’s Last Night of the Proms, recording with the Mormon Tabernacle Choir, playing lead trumpet with the renowned Canadian Brass and putting on a solo Command Performance for Her Majesty Queen Elizabeth II. He has also been nominated for Grammy and Juno awards and won the prestigious Echo Klassik in Germany and British Bandsman 2011 Solo CD of the year. He has also received several honorary doctorates. Lindemann has achieved considerable critical acclaim around the globe: “he gave a sizzling, high energy performance in the American premiere of the Canadian trumpet concerto ‘Dreaming of the Masters’ at Carnegie Hall” (The New York Times); “a world-class talent” (The Los Angeles Times); “one of the most memorable recitals in International Trumpet Guild history”; (ITG), “performed brilliantly in the North American premiere of Bernd Alois Zimmermann’s Concerto with the Toronto Symphony” (Toronto Star); and “he gave the virtuoso highlight of the evening with the Montreal Symphony” (Montreal Gazette). Lindemann also joins the ranks of other esteemed Yamaha artists who have been awarded the Order of Canada, including Phil Nimmons (clarinet), Ian McDougall (trombone) and the late Oscar Peterson (Bösendorfer and Clavinova). He performs on 24k gold-plated Yamaha trumpets, including the Artist Model Xeno and Custom Xeno models. In addition, Jens has been an instrument development artist on several new models, especially the YTR988 rotary piccolo trumpet. For more information, please visit http://4wrd.it/JENSLINDEMANN.